Each year 22 students inYear 5 and are selected for the Instrumental Music Program's (IMPACT) Band Program. This is a specialist program provided by specialist music staff from the ACT Department of Education and Training along with school based teachers. Student selection into the program is based on musical aptitude, work habits and motor skills. Some of this information is gathered from classroom teachers at the end of year 4, with the aptitude test completed early in year 5. All students participate in the testing and offers are made to students early in Term 1 of year 5. There are no prerequisites for reading music or knowing how to play an instrument. 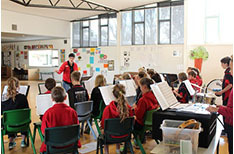 Selection into the band is a two year commitment, with the same students continuing into year 6. This is a wonderful program based on team work, fun and learning new skills. 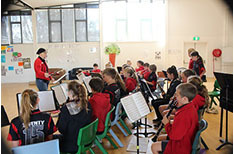 Majura Primary has a woodwind band consisting of flutes, oboes, clarinets, saxophones and percussion. The specialist IMP teacher spends time working with students to work out which instrument is best suited to them. Three clarinet players are chosen at the end of Year 5 to play the Tenor Saxophone, Alto Saxophone and Bass Clarinet. 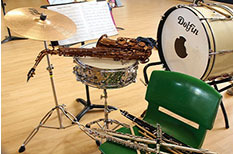 The students play in combined practices with neighbouring schools and form a full concert band with woodwind and brass instruments. This is a thrilling experience! Throughout the two years the students may perform at Floriade, assemblies and other events at school and in the community. At the conclusion of Year 6 the students perform in a multi-band evening - Bandstravaganza, at the ANU School of Music.